I've been terribly slack about updating this lately - time has been a big issue as with taking on the additional speedway committment at Rye House my weekends seem to have been eaten up somewhat. However - good reason for showing off the shot to the right as it is my first shot published by the Speedway Star on submission. 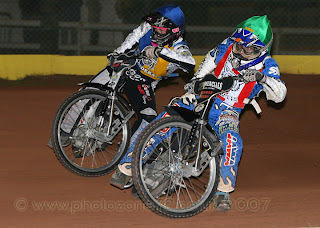 :-) I've been sending shots in weekly from my Rye House meetings but until now, no luck. This one, however, obviously made the grade and so there it is - on page 37 to be exact!